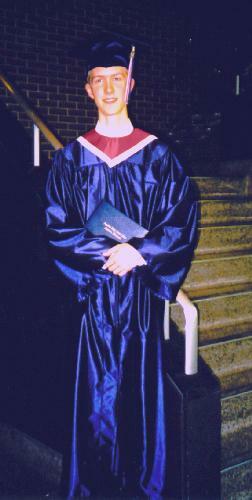 My oldest son, Stephen, turned 18 in May and graduated from East High School in June. 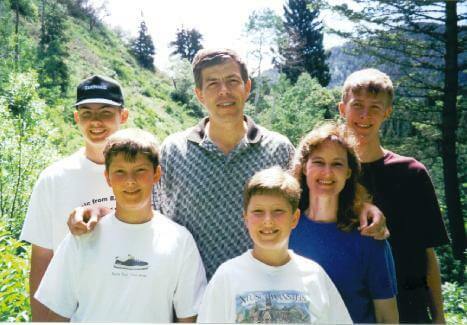 We then took him and the whole family out to Utah to take him to Brigham Young University, where he began attending summer term. We're tremendously proud of Stephen and are impressed with his many accomplishments (high grades, great scholarships, musical excellence, and all around wonderful guy). My son Stephen and Meliah Lipp became engaged while out at Brigham Young University. A wonderful couple! Stephen is now in Argentina serving a mission for the Church of Jesus Christ of Latter-day Saints. 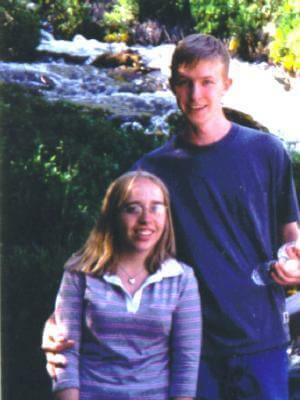 Here they are near a Utah stream (photo actually was taken in 2002). Meliah is a marvelously talented and intelligent young lady with widely recognized musical skills (she teaches violin and has received many honors for her violin performances), currently working on a degree in mechanical engineering. We're glad to have her be part of the Lindsay family. Before taking Stephen out to BYU, we had a wonderful piano recital with the pupils of famed instructor Bishop Bent. All four of our boys performed - and performed well. This was right after the performance in June. 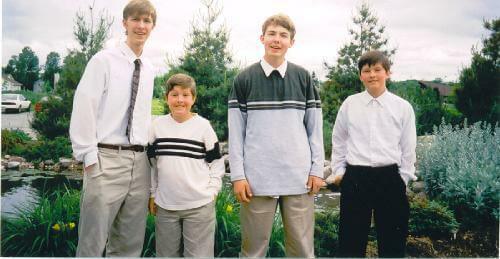 My boys, in order of height, are Stephen, Daniel, Ben, and Mark. 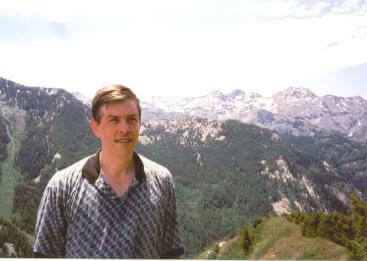 While in Utah in June, we hiked to the top of a mountain accessed from Butler trail in Big Cottonwood Canyon near my parents' home in Salt Lake City. Here we are partway up the trail, enjoying the scenery. Meliah Lipp kindly took this photograph. A shot of me enjoying the view from the summit. While in Utah, we hiked up Mount Timpanagos to a famous cave. 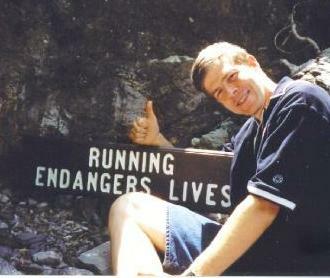 Along the steep trail, I was pleased to find this sign. Truer words were never carved in wood. Now you know why I gave up jogging. In late 2001, this picture was taken in our home in Appleton. 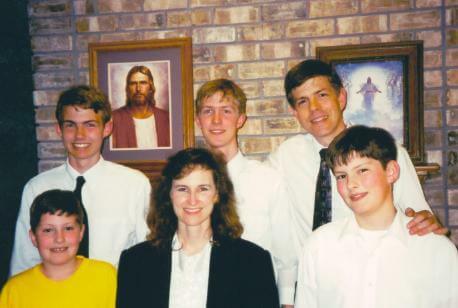 From left to right, beginning in the back, are Daniel Lindsay (15), Stephen Lindsay (18), Jeff Lindsay (age unknown), Mark Lindsay (9), Kendra Lindsay (29 or so), and Ben Lindsay (12). 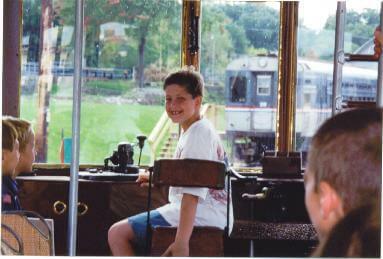 Stephen was then a student at Brigham Young University, home for a few days. He's currently on a two-year mission for the Church of Jesus Christ of Latter-day Saints in Buenoa Aires, Argentina.